September’s night sky brings a Harvest Moon. Mars, Saturn and Jupiter are all close to the horizon and can be seen in the southern part of the sky. 2018 may be your last chance to see an Iridium Flare. The Harvest Moon: 25th of September. The full Moon on the 25th is designated as the Harvest Moon. This is because the full (or almost full Moon) in September rises at around the same time each evening, therefore prolonging twilight and traditionally helping to bring in the harvest. 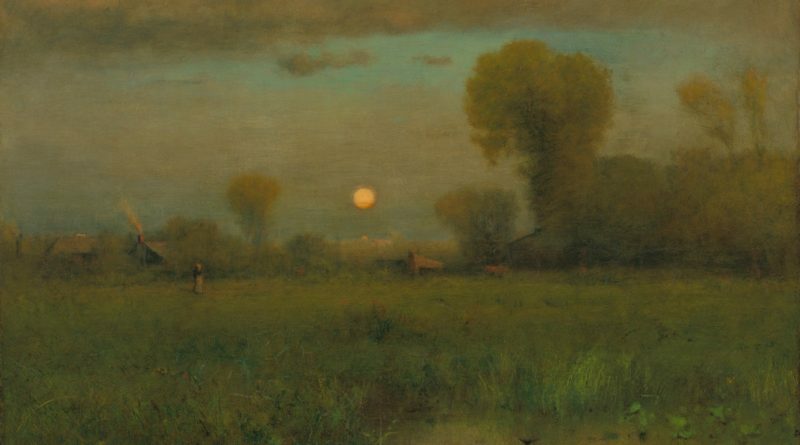 Image above: Harvest Moon by George Inness – thanks to the National Gallery of Art Washington, Corcan Collection (Bequest of Mable Stevens Smithers). A “Flarewell” To The Iridium Flare. Whilst looking for Perseids I was lucky enough to see an Iridium Flare. However, this is likely to become a rarer occurrence. The Iridium satellites are an array of 66 telecommunication satellites. An unintended consequence of their design is that they reflect the Sun back to Earth. To observers on Earth the satellite increases in brightness for a short moment before fading back again. This glinting is known as an “Iridium Flare”. One of the good things about Iridium Flares is that they are predictable. Websites like “Heavens Above” can show the time and duration of the flares for any location. However, the original Iridium fleet is now being decommissioned. The satellites are being replaced with a new design that does not reflect the Sun. The new satellites do not “flare”. Some of the remaining satellites will stay in orbit for a while. However, their orbit will be one of a controlled descent. This means that the flares will no longer be predictable. Heavens Above will continue to track Iridium Flares, but acknowledges that its predicted paths for the satellites will be less reliable. Iridium are scheduled to replace all their old satellites by the end of 2018. Their progress is being recorded here on the website: Flarewell. It makes for a poignant read, as hobbyists the world over bid farewell to their favourite satellites. Here is a suitable valediction, borrowed from the Ukulele Orchestra of Great Britain. In the first week of September all three of the planets; Jupiter, Mars and Saturn can be seen in a row. Look towards the south when darkness falls, you will need a clear horizon to see them. Jupiter is low in the southwest. Look for it around 45 minutes after sunset – a bright “star”in the evening twilight. A crescent Moon is close to Jupiter on the nights of the 13th and 14th. Saturn is low in the south, look for it after sunset. Its rings are very open at the moment so it is an impressive sight, even in a small telescope. The Moon is near Saturn on the 17th. Mars is also low in the sky. If it can be seen, it’s obvious in the southeast – shining as a bright red star. Look for it from 10.30 pm onwards. By the end of September, Mars will be slightly higher in the sky (though still low). A telescope may reveal some surface detail. Venus can still be seen of you have a clear horizon to the west (it is very low in the sky). Because it is so bright it can be seen shortly after sunset. Look towards the southwest from around 7.45pm. Venus is now sinking towards the horizon and from the third week of September it is unlikely that we will be able to see it. Neptune can be located this month. Try looking through binoculars or with a telescope to see if you can find it lying in the constellation of Aquarius. The distant planet should be visible as a blue dot. Best viewing will be on the nights of the 7th – 12th of September, as there is not much moonlight around then. Location maps and lots of info. available here: The Sky Live: Neptune. Up until the 15th of September, ISS can be viewed in the early hours of the morning in time slots between 3.31 am and 5.54 am. ISS fly pasts are relatively short, around 5 minutes, so to be sure of seeing the station it is best to check the Spot the Station site for the exact times, direction and duration. It is also possible to sign up for text and email alerts using the link here: Space Station Alerts. The service only alerts you to good sighting opportunities, that is sightings that are high in the sky and of enough duration to have a chance of spotting the space station. Derby And District Astronomical Society. The astronomical society’s next “Introduction To Astronomy” evening will be held on Friday 21st September 2018 from 7:30 pm onwards at The Friends Meeting House, St. Helens Street, Derby, DE1 3GY. DDAS member Mike Lancaster will be talking about what you can see in the September sky. If you need help and advice with a telescope or binoculars then why not bring them along to the meeting and a member of the society will try to help.